If it’s any consolidation, the inability to count does indeed indicate the quality of argument that the video offers. That being, little to none. It does serve as a warning to the video about the leaps in logic, reasoning, bias that the ~14 minute video presents. Looks like we weren’t the only ones to heed the warning about the quality of content from Jonathan. [Live] Debate: Is the Crucifixion a Fact? Today at 2 PM (EST – New York, Trinidad), 7 PM (GMT – London) Br. Aqil Onque will be debating Pastor Angelos Kyriakides on the topic of the Crucifixion. The stream will go live on YouTube at the above mentioned times. Questions for the debaters can be submitted in the YouTube Live video’s chat and will be read to the debaters during the Question and Answer session. Please indicate whether you are a Christian or a Muslim at the start of your question. Not all questions are guaranteed to be asked and the length of the Question and Answer session is dependent upon the debaters’ discretion. Topic: Is the Muslim Denial of Jesus’s Death by Crucifixion Valid? Debaters: Br. 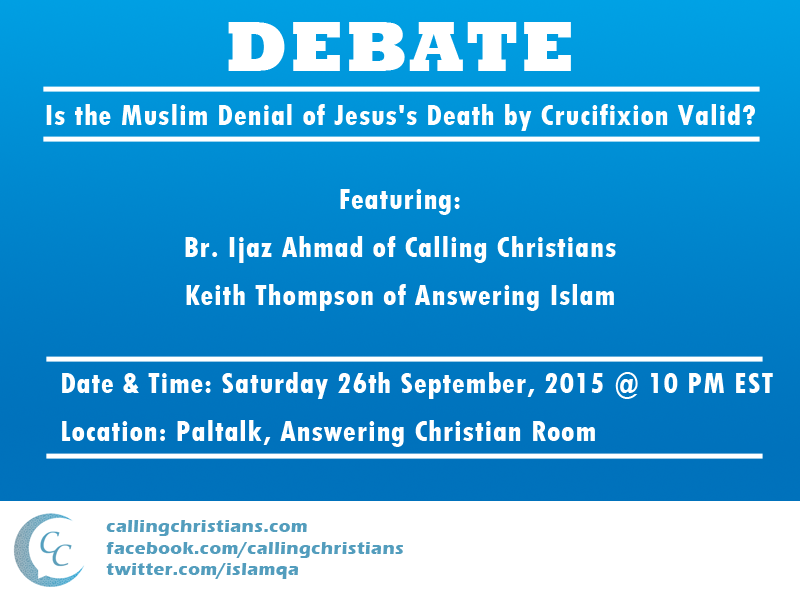 Ijaz Ahmad of Calling Christians and Keith Thompson of Answering Islam. Date: Saturday 26th of September, 2015. Location: Paltalk, Answering Christianity Room. Keith Thompson is a Christian apologist who runs Reformed Apologetics Ministries and has been writing for Answering-Islam.org since 2008. He is a debater having debated opponents such as Inamullah Mumtaz, Sami Zaatari, Nadir Ahmed, Peter Dimond and others. 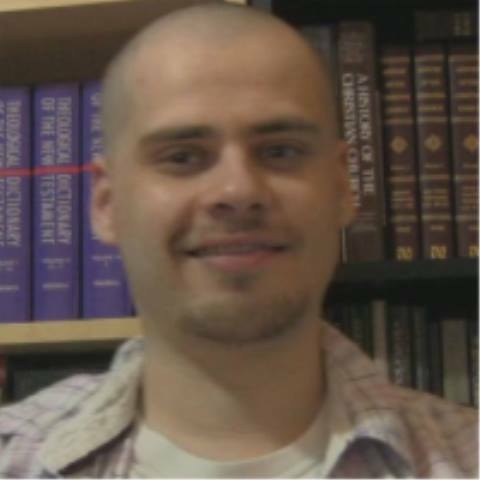 He resides in Canada and will be completing his seminary studies shortly. This will be my (Br. Ijaz’s) third debate for the year, with one final (fourth) debate to be announced shortly. The final debate will be with a well known Christian scholar and will be televised (and is expected to be streamed live). The debate is to be held on Friday October the 9th, 2015 (tentative dating). If you don’t use Paltalk and would still like to view the debate between Keith and myself, alternative arrangements may be made for a YouTube streaming of the event (tentative), or a recording should be available within a week’s time (on YouTube via Nazam44’s and MuslimByChoice’s channels). If you or someone you know is interested in debating me, do send a request via our contact us form. As recently as November of last year I’ve been examining the nature of Christ’s “death”. I published a couple musings about it, didn’t receive much in the way of answers, as much as I did receive criticisms by one particular has been. Building on my studies and discussions with significantly more intelligent Christian missionaries and apologists, I decided to author a piece expressing more of my logical expansions on the topic at hand. This is the result, a 1000+ word article that uses Christian references and explanations to describe the nature of Christ’s death, leading to a pretty interesting conclusion. Despite writing the article, my curiosity about the ‘death’ of a God is still there. I can’t fathom how an absolute, all powerful deity can perish, whether metaphorically or otherwise. I suppose there’s much more to come from this area of study. The article is available via the Muslim Debate Initiative’s website. and the logic is theologically sound.